Yesterday I posted about Brad’s rich and creamy Peanut Sauce and now I want to share with you how I used the sauce to make a healthy veggie-filled dish. The sauce comes together in 10 minutes or less and this stir-fry didn’t take that much longer. In fact, if you make the peanut sauce ahead of time, which only makes it better, you can have dinner on the table in 30 minutes flat. Nothing makes me happier than a quick and easy (and healthy and delicious) meal. Especially on days when I feel super tired. I have a feeling with the baby coming that these days are in my near future. Baby E and I have been up since 2:30 am (It’s currently 7:30) and when I say “we”, I mean he was very active last night thumping and kicking and it was wonderful. It was the first time I’ve felt him kick (only small flutters every few weeks before). Brad happily rolled over to feel him when I woke him up a little after 3 am. But I think even on 3 1/2 hours of sleep, I could throw this meal together successfully, which makes it a winning recipe in my book. 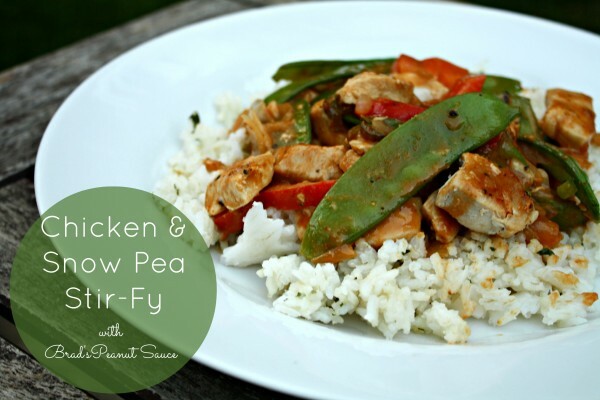 This quick and easy stir-fry is chock-full of beautiful colorful veggies, but the shining star is the decadent peanut sauce. Cut chicken into small bite-size pieces. Heat one tablespoon of oil in a large pan. Add chicken to pan and cook, stirring and flipping occasionally until chicken begins to brown slightly. Cut peppers into strips. In a second large pan (while the chicken is cooking) heat the remaining tablespoon of oil. Add vegetables and stir regularly until onions begin to caramelize. Add chicken to pan. 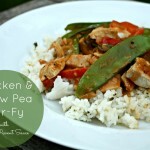 Pour peanut sauce over the contents of the pan and stir to mix thoroughly throughout the chicken and vegetables. Plate rice and top with chicken, vegetables, and peanut sauce mixture. 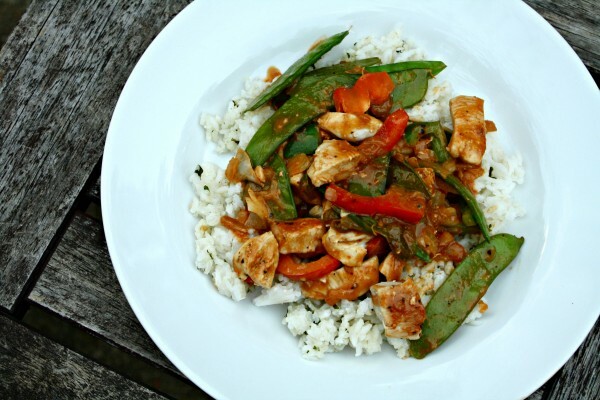 This meal can be done from start to finish in 30 minutes or less if you cook the chicken, veggies, and rice simultaneously as the directions describe.